After a hard fought match, men’s tennis came up just short against Florida State this Friday, losing 4-3. They currently hold a 12-8 overall and 1-5 conference record. At No. 1 doubles was senior Christopher Morin-Kougoucheff and freshman Fabien Salle. Senior George Hedley and freshman Sergio Hernandez played at the No. 2 spot, followed by senior Federico Gomez and freshman Alex Wesbrooks at No. 3. Wesbrooks and Gomez finished first falling 6-2 to the Seminoles. Courts one and two were both tied at 6-6, making it a very close competition for the doubles point. Morin-Kougoucheff and Salle then fell 7-6, finishing the doubles portion of the match. To kick off singles, court one and six were taken over by the Seminoles, giving them a 3-0 lead. No. 4 Salle fought back for a 6-4, 6-4 win, followed by another win (6-4, 7-6) by freshman Hernandez at the No. 3 spot. The overall score was tied at 3-3 when No. 5 Gomez went into a third set to ultimately win his match 6-7, 6-2, 6-3. The fate of the match was placed on court two, where the Cards were unable to secure the win. The Cards prepare for a busy weekend with three matches on the schedule. 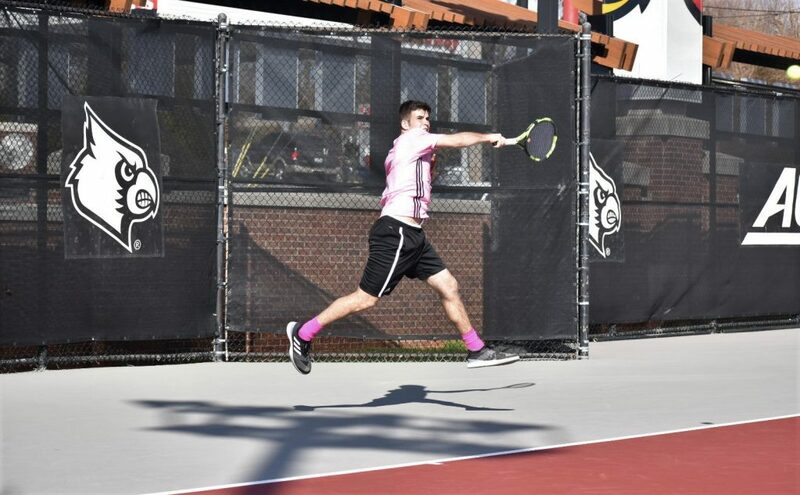 Men’s tennis hosts Miami on Friday, March 29 at 1:30 p.m., followed by a doubleheader against Duke on Sunday, March 31 at 1:30 p.m. and Illinois State at 7 p.m. All three matches will be played at the Bass Rudd Tennis Center.